It’s impossible to start talking about Blossom without asking “what happened?” Milky Chance stepped into the world’s spotlight with their 2013 single “Stolen Dance,” a fun guitar polka of a song that asked folks to “do the boogie,” and most did. It was slow, but its dreamy guitar plucking and enthusiastic vocals from Clemens Rehbein made it a hit for many; and most were not disappointed by the rest of the debut album, Sadneccessary, which featured many songs of the same vein. What helped create the dreamy vibe was a collection of guitar riffs surrounded by a fog that sounded as if there’s a party in the distance and Rehbein is on his way to join. 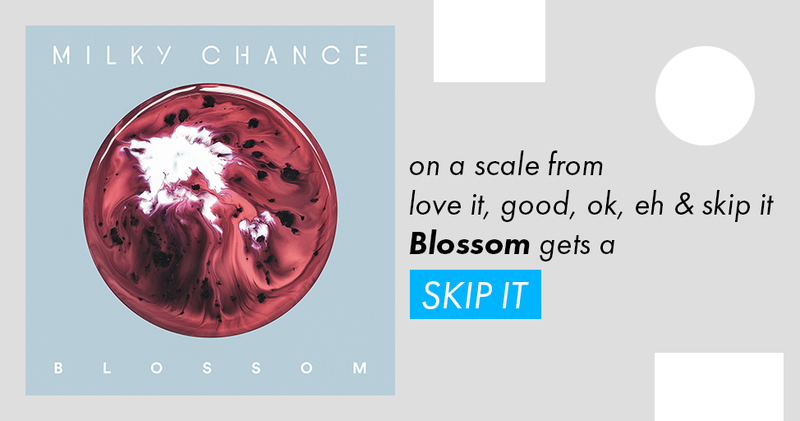 Blossom, unfortunately, does not have that dreamy vibe or same excitement that Milky Chance had in their previous album. In fact, most of the signature moments that made “Stolen Dance” a hit are really hard to come by in this album. There is nothing wrong with changing direction, but it seems like more was taken out than put in. “Blossom” is everything that is good about the album. It makes it very clear that while the influences from the previous album are still around, this is a much cleaner production. The vocals balance well enough with the background guitar and modest electronic keys. The guitar riff is great and the song is quite catchy, making great use of lead singer Clemens Rehbein’s raspy and expressive voice. Overall, it is a fun start to the album. “Firebird,” and mildly the previous song “Ego,” signifies all the warning signs for an incredibly uninteresting listening experience. Rehbein is still very fun to listen to, but the stripped-down medley in favor of an acoustic guitar production is not at all memorable and does nothing to stand itself out. In fact, I wrote this section while listening to the song and after it ended, I couldn’t remember any part of it. “Clouds” marries the vocals with the new direction well, but the song suffers greatly from a strong inconsistency in pacing and tone. It’s a shame because “Clouds” is one of the more fun and enjoyable songs on the album. The chorus is fantastically tropical and speeds up to a dance party. What stops this song from reaching a notable height is the vocals. Rehbein sings very slow and methodically, causing the verses to be unbearably slow until the song uncharacteristically picks up on the chorus. The inconsistent pacing makes a potentially fun song a reluctant dance song. It seems like Milky Chance wanted to create an album that was more mainstream and focused on making songs that sound very similar to many other indie bands. Gone is the abstract and wild electronic decisions from Sadneccessary and in comes the acoustic and electric guitar focused songs. The guitar was a pillar of the previous album, but much of the creativity in terms of arrangement and tone is long gone. Perhaps the hope of making a weaker production was to focus on good writing, akin to the best folk albums, but this is not the case. Blossom, in terms of lyrics, only provides vague love metaphors which are nowhere near strong enough to set aside the production criticisms. In changing their style, Milky Chance lost their signature flavor, leading them to sound more like every other indie pop band. It’s very hard to recommend anything outside of the first song, “Blossom,” and even then, there are plenty of better albums to listen to, whether you like electronic, indie, pop, or folk. SKIP IT.